My ws-security setting doesn't work. My WS-security reference site is https://docs.jboss.org/author/display/JBWS/WS-Security. Deployment threw no exception. But WS-security encryption was not applied to wsdl. Generated soap file was just plain xml file. WS-security encryption setting doesn't work. Did i miss anything? I need your advice. Thanks in advanced ! 1. Re: My ws-security setting doesn't work. Are you following https://docs.jboss.org/author/display/JBWS/WS-Security ? Have you tried making a typo in the xml to make sure it's being picked up? 2. Re: My ws-security setting doesn't work. But wssecurity.properties file seemed not to be picked. Any idea? Thanks in advanced! 3. Re: My ws-security setting doesn't work. Are they picked up if you hardcode the file locations? 4. Re: My ws-security setting doesn't work. But the deployment was successful. The value of property-name element is just a string but calls nothing. 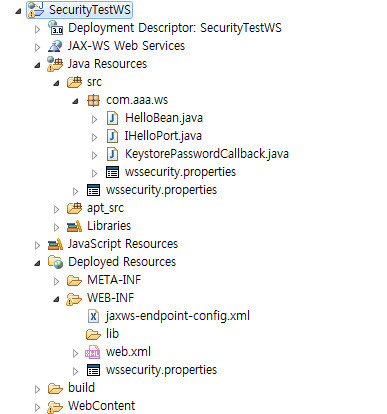 I think jaxws-endpoint-config.xml file does not recognize 'property-name' elements. But the same results. How can I make my bean file pick up wssecurity.properties files? I need your advice, desperately! 5. Re: My ws-security setting doesn't work. Where is the properties file in the final WAR? In classes root? 6. Re: My ws-security setting doesn't work. Is there any editing of this element? 7. Re: My ws-security setting doesn't work. 8. Re: My ws-security setting doesn't work. My problem is that 'property-name' and 'property-value' element of jaxws-endpoint-config.xml do nothing. In my WAR project those elements are just a set of string, nothing..
<property-name>ws-security.signature.properties</property-name> =>can't be recognized and invoked. <property-value>WEB-INF/wssecurity.properties</property-value> =>can't be recognized and invoked. I don't know why. Any idea? Nicklas! 9. Re: My ws-security setting doesn't work. And you are really, really sure that the properties file is included in the final WAR at the chosen location? 10. Re: My ws-security setting doesn't work. I put the properties file in all possible localtion. See my attached image. But same result. In JBoss 5, I used @EndpointConfig(configName="Standard WSSecurity Endpoint") annotation and set its properties in jboss-wsse-server.xml as you know. I think I have to do somthing with below elements in standalone.xml of jboss 7. I think there is another endpoint-config name related to ws-security and i can set ws-security properties like jboss-wsse-server.xml of jboss 5. Am i right? If i am, pls, inform me of any doc or referenece site. 11. Re: My ws-security setting doesn't work. 12. Re: My ws-security setting doesn't work. Nicklas, thanks for the help. Joseph, please consider having a look at the jbossws-cxf 4.1.1 binary distribution (you can download it at http://www.jboss.org/jbossws/downloads ) and in particular at its samples. Look at the wsse/policy ones, there're many test deployment using ws-security policy. Build the samples by running the testsuite and have a look at the test jar/war archives. Generally speaking, the endpoint-config configuration in standalone.xml are system wide configurations and you can't expect to reference deployment descriptors from that. Re: how to migrate jboss-wsse-server.xml setting of jboss 5 to jboss 7.1?